official website National Apprenticeship Training Scheme NATS under of HAL Apprenticeship Program@http://117.192.11.243/tti. 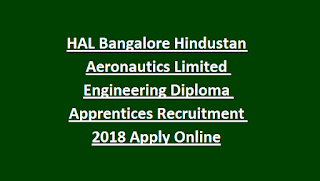 HAL Graduate Apprentices under the Apprenticeship act 1961 of Avionics Division Bangalore for one year Apprenticeship Training @Technical Training Institute HAL BC for year 2019-2020. HAL is a navaratna PSU company running under the outline of govt of India ministry of defense. Eligible candidates can apply online on or before the closing date of 07-10-2018. Selection for this recruitment will be based on the merit in educational qualifications and performance in walk in interview. For more information please see the details given below. Click here for official notification of Aeronautics Limited Bangalore. https://hal-india.co.in/Common/Uploads/Resumes/888_CareerPDF1_DIPLOMA%20NOTIFICATION%202018.pdfFollow us on Twitter @govtjobonline. Right now vacancies given only for Diploma Apprentices. For Diploma Technician Apprentice Training candidates must have qualified 3 years diploma in Civil/Electrical/Electronics and Telecommunications or Mechanical or Computer Engineering. Upper age limit is are applicable as per government of India norms. For Graduate Apprentice Rs 4984/- per month will be given. Selection for this Hindustan Aeronautics Limited will be held based on marks obtained in qualifying exam only. There is no written test for this Apprenticeship program. Candidates should not have more than one year experience. Candidates who are passed out in 2016 and 2017, 2018 they are eligible to apply. Candidates have to apply online @ www.hindi.hal-india.com. Must have upload the educational certificates and necessary certificates. Must have entered the valid Email Id and Mobile Number. 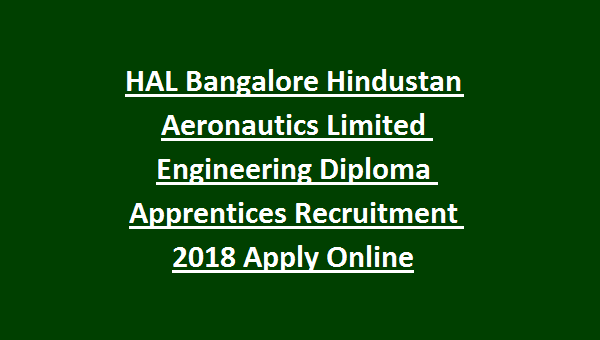 Click here to download notification for the Bangalore HAL Engineering Graduate Apprentices Recruitment 2018. Please share this HAL Bangalore Engineering Graduate/Diploma Apprentices Training Recruitment 2018 article to your lovable friends through social networking sites.